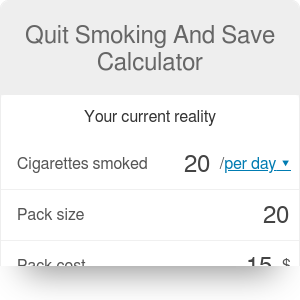 How does this cigarette cost calculator really work? Smoking is a serious addiction, but if you are a smoker, you're definitely aware of it. It accounts for roughly 480,000 deaths annually in the US alone and millions more around the globe. As you can check in our smoking recovery calculator, it tends to significantly shorten your life, too. One thing we tend to forget, however, is how regular smoking can affect our budget. We collect the number of cigarettes you smoke and assume you invest the money you don't spend on them (the default return on investment (ROI) is set to 4%, feel free to change it). As is often the case, people greatly underestimate the power of compound interest. Let's take a typical scenario: a pack of Marlboros costs $6.50, John smokes 20 cigarettes per day. He's 25 years old and wonders: what could I buy at 55 if I quit now and saved that cash? The plain, uninvested cash alone gives a pretty nice sum: over $71,000. But when invested at 4% per annum, it gives an additional $66k for a total sum of $137,000... that's 137,000 reasons to quit smoking now! Where exactly did the 4% ROI come from? Warren Buffett, one of the most successful investors in the globe, shared his predictions on the average return from stocks in a Bloomberg article. He estimates the return at a level of 7%. This number is also consisten with historical data. After taking inflation of approximately 3% into account, we get 4% ROI that we use in this Quit Smoking and Save Calculator. An additional problem to keep in mind is that the prices of cigarettes increase every year due to new taxes imposed by governments trying to tackle the problem. The trend is simple - if you keep smoking the same amount of cigarettes for years to come, it will only cost you more. Suppose you're a heavy smoker and need a fresh pack of 5$ cigarettes every day. If you quit smoking today and managed to stay clean for another 30 years, your budget would grow by only 1,825 bucks this year and by over $100,000 by 2048 (assuming 4% annual return rate). Even if you're more of an occasional smoker and need on average only two puffs per day, in 10 years, you'd be richer by over $2,000. Sounds tempting? Play a bit with the smoking cost calculator and see how would your savings shape in various scenarios. While developing this cigarette cost calculator, we used common formulas previously known from the investment calculator. Those formulas shape the interests that appear in light blue on the chart above, while the dark blue part is the actual amount that you simply wouldn't have spent. As you can see the interests grow at a much faster rate as the years progress, significantly increasing your savings. Quit Smoking And Save Calculator can be embedded on your website to enrich the content you wrote and make it easier for your visitors to understand your message.